 The JOIDES Resolution (JR) is a seagoing research vessel that drills core samples and collects measurements from under the ocean floor, giving scientists a glimpse into Earth’s development. Data from the JR’s ocean drilling offer a scientific means of understanding climate and environmental change throughout a significant part of our planet’s history—a research subject often termed Earth’s paleoclimate. The JR’s core samples are the “smoking gun” in evaluating many historical events related to paleoclimate, changes in the solid earth and more — like the extinction of the dinosaurs and plate tectonics, for example. Why “JOIDES Resolution?” The research vessel is named for HMS Resolution, commanded by Captain James Cook over 200 years ago, which explored the Pacific Ocean, its islands, and the Antarctic region. Like its namesake, the purpose of our current Resolution is to sail for scientific exploration. This time, those discoveries lie beneath the ocean floor. JOIDES is an acronym for the Joint Oceanographic Institutions for Deep Earth Sampling, which represents the original partnership of universities that sought to explore the geology beneath the ocean floor. Today the ship is used by scientists at hundreds of universities around the world. Work aboard the research vessel never ceases; operations continue 24 hours a day. JOIDES Resolution’s complement can consist of 50 scientists and technicians and 65 crew members. The crew consists of marine professionals and ocean drilling specialists, among others. The JR’s science party is specific to each mission, with skills and science disciplines chosen especially to best achieve the mission’s goals. The JR began working for the Ocean Drilling Program (ODP) in 1985. Drilling with ODP continued until September 2003, at which point the Integrated Ocean Drilling Program (IODP) began. IODP is an international research program that explores the history and structure of the earth as recorded in seafloor sediments and rocks. From 2006-2008, The JR was completely retrofitted with exciting new scientific drillling equipment, new structural improvements and significant upgrades. It is almost a whole new ship! The JR returned as IODP’s “light” drilling vessel in 2009, along with the riser vessel Chikyu operated by Japan, and mission-specific platforms operated by the European consortium ECORD. In 2013, the program was renamed the International Ocean Discovery Program. The JOIDES Resolution is owned by Overseas Drilling Limited, a subsidiary of Siem Offshore AS, and the ship is operated by the JOIDES Resolution Science Operator (JRSO) at Texas A&M University through funding from the U.S. National Science Foundation. Water covers more than 70 percent of Earth’s surface. So we need to get through all that water to get to the part of Earth underneath! Geoscientists explore the oceans to better understand Earth’s fundamental processes. Earth’s surface constantly changes and evolves. Scientific drilling in the oceanic crust allows scientists to learn more about forces such as volcanoes and earthquakes, which affect millions of people. They also investigate other changes in Earth surface such as ocean crust formation and destruction, mountain building, and the movement of tectonic plates. Earth’s sea level constantly fluctuates in response to climatic and tectonic forces. Scientists examine sediments and rocks recovered from drill sites in the ocean to develop models of the ocean’s history. These models, in turn, can help countries manage coastal zones. Sediments found beneath the ocean floor are in part composed of skeletal remains of plants and animals. By studying them, scientists learn more about what organisms lived on our planet at different times in Earth’s past and what those organisms can tell us about the climate at those times. The Integrated Ocean Drilling Program constantly refines existing systems and develops new technology. Current projects include developing systems to drill into highly fractured formations, to withstand extremely high temperatures, and to drill deeper into the ocean’s crust than ever before. Scientific ocean drilling has yielded many significant and exciting discoveries over four decades of expeditions. • Confirmed the theories of plate tectonics and continental drift. • Provided major insights into changes to our global climate over the past 100 million years. For example, in 2004, core samples recovered from the seafloor beneath the Arctic Ocean revealed that 55 million years ago the Arctic region had a subtropical climate. Scientists continue to analyze these findings to better understand how ecosystems will respond to future global warming. • Altered our thinking about the formation of geologic hazards like earthquakes, volcanoes and tsunamis. • Discovered methane, in the “frozen” form of hydrates, in sediments below the ocean, and confirmed that they exist worldwide. • Discovered a vast and active biosphere of microbes living deep below the seafloor, far deeper than scientists ever predicted life could exist. “Sea sediments reveal how much ice existed in the world and hint at past temperatures and weather patterns. Ice cores also provide a glimpse of past temperatures and preserve tiny bubbles of ancient atmosphere. Coral, tree rings, and cave rocks record cycles of drought and rainfall. Each piece of this complex puzzle must be put together to give us a picture of Earth’s climate history.